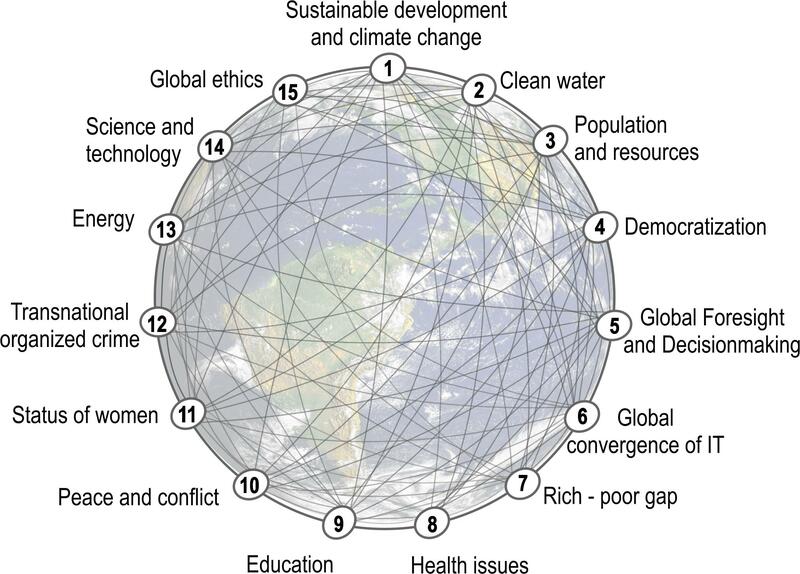 The Millennium Project conducts global futures research via 64 Nodes around the world (groups of individuals and institutions) that connect global and local perspectives on research & methods about future of the human condition. 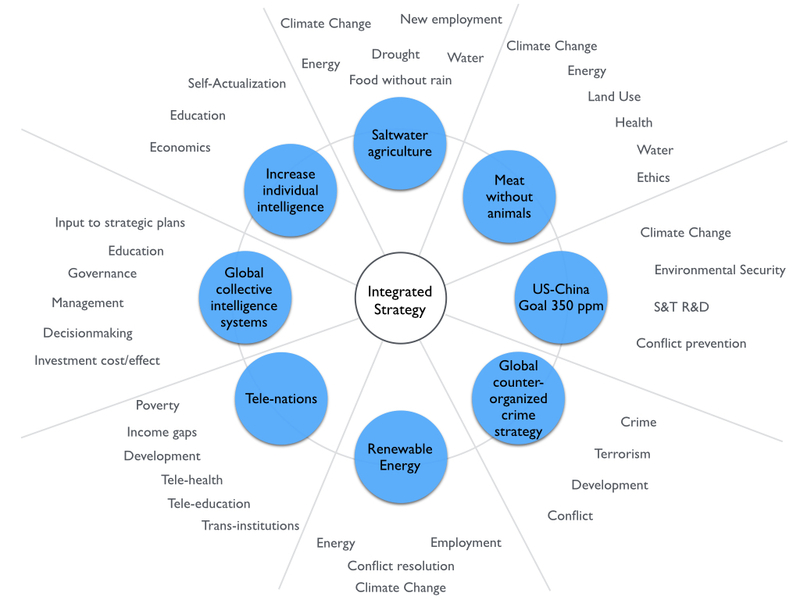 Futurists and other experts organized by The Millennium Project provide a coherent framework to understand global change and prospects for the future. Possibly the most comprehensive synthesis of future challenges - from AI, synthetic biology, robotics, and nanotech to work, terrorism, climate change, population, gender, global ethics, and the next economics - in clear, precise language. The 2017 State of the Future Index, contained in this report, shows worldwide progress over the past 20 years and continued progress over the next ten years in education, poverty reduction, infant mortality, water access, health, life extension, internet, and women in parliaments, but regression or stagnation in press freedom, internal conflicts, organized crime, employment, corruption, information warfare, and global warming. The State of the Future 19.0 brings together an extraordinarily diverse set of data, information, and intelligence to provide a coherent framework to help us think tougher more clearly about the future. 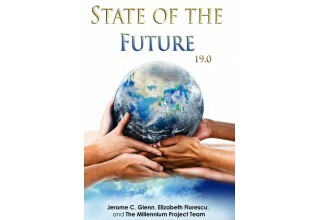 This is the 19th edition of the "State of the Future," since the Millennium Project’s first edition in 1997. 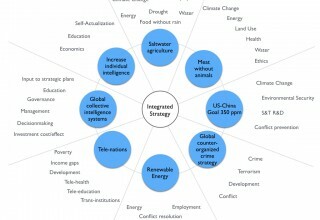 This global assessment of our future includes an executive summary and chapters on 15 Global Challenges; the 2017 State of the Future Index; future terrorism and new deterrence technologies and strategies; Future Work/Technology 2050 Global Scenarios with 100 actions to improve our prospects, and ending with a chapter of key conclusions. 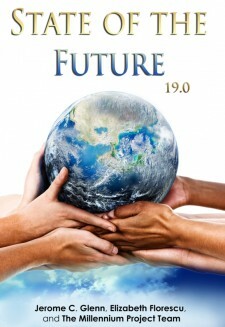 Many children born today will see the year 2100. About 3 billion people could be living in the “Self-Actualization Economy” by 2050, finding markets around the world for their interests, rather than looking for a local job. Universal basic income to address potential massive unemployment may not be financially sustainable in many parts of the world until 2030; national cash flow projections are needed to show when and how UBI can be financially sustainable. In the foreseeable future, an individual acting alone could create and deploy a weapon of mass destruction; a new social contract between government and citizens is needed to prevent this, including new family and community responsibilities. Doing everything right to address our global challenges like climate change or counter organized crime in one country will not make enough of a difference if other countries do not act as well. 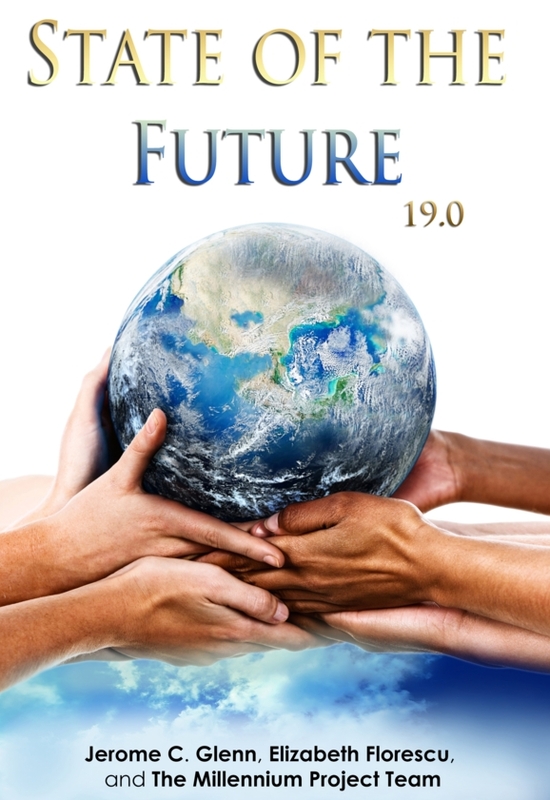 “The State of the Future 19.0 is a fantastic, robust and complex, handy, compendium that describes how human evolution ‘2.0’ is unfolding at a faster rate than ever considered possible,” says Adriana Hoyos, Senior Fellow at Harvard University. “This is one of the best studies of modern terrorism and what to do about it that we have at our disposal,” writes Jamie Shea, Deputy Assistant Secretary-General of NATO. The Millennium Project is an independent nonprofit global participatory futures research think tank of futurists, scholars, business planners, and policy makers who work for international organizations, governments, corporations, non-governmental organizations, and universities. 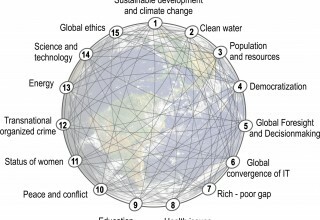 It has 63 Nodes (groups of institutions and individuals) around the world that identify long-range challenges and strategies, and initiate foresight studies, workshops, symposiums, and advanced training. Over 4,500 experts have participated in The Millennium Project’s research since its inception in 1996. The Project’s mission is to improve thinking about the future and make those insights available through a variety of media for feedback to accumulate wisdom about the future for better decisions today. It produces the annual "State of the Future" reports, the "Futures Research Methodology" series, the online Global Futures Intelligence System (GFIS), and special studies, advanced training, and workshops. 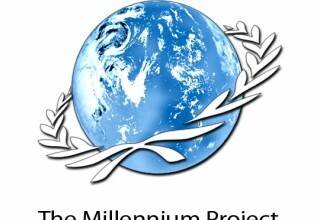 The Millennium Project was selected among the top think tanks in the world for new ideas and paradigms and for best quality assurance and integrity policies and procedures by the University of Pennsylvania’s GoTo Think Tank Index, and was named Computerworld Honors Laureate for its contributions to collective intelligence systems. 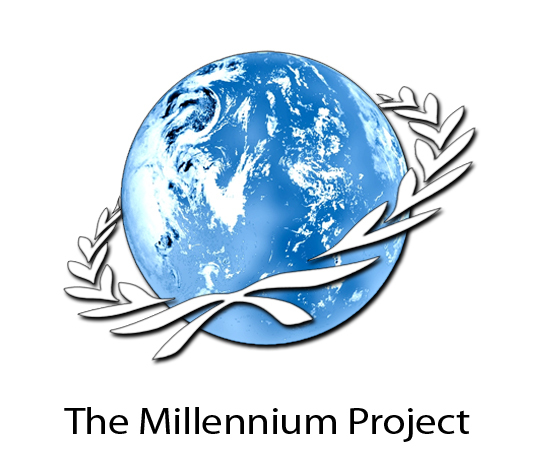 Sign up for email updates from The Millennium Project.